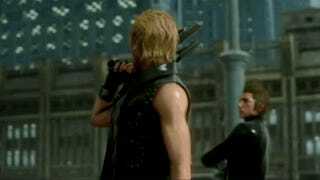 Today, Square Enix showed off the first live gameplay footage of the eagerly awaited Final Fantasy XV. There's also a look at the fancy tech that powers the game and a cute frog in the rain. FFXV director Hajime Tabata said he wanted to show off live gameplay, because some people online seemed to think that the recently released Final Fantasy XV trailer was all pre-rendered. As you can see in this NicoNico stream, it wasn't. During the stage presentation, Tabata said that next year's demo will look even better than the footage shown today. In the video below from the NicoNico stream, be sure to click on "HD" to watch the clip in, well, HD. Do note that while this is a 720p capture of a stream at sixty frames per second (the settings it was broadcasted at), there is some loss in image quality. This certainly does not look as good as the footage would currently look on a PS4 or Xbox One. Final Fantasy XV is currently slated for the PS4 and the Xbox One. You can watch more clips on NicoNico below.